Also known as cold laser therapy, Health First Chiropractic offers low level laser therapy (LLLT) as the perfect addition to chiropractic care. LLLT has been shown to be an extremely useful addition and great supplement to chiropractic treatment. Low level laser therapy (or cold laser therapy) is the use of laser light to relieve pain, reduce inflammation and promote soft tissue healing. It is a sought after treatment for acute soft tissue injuries, chronic pain syndromes and has shown to be particularly helpful in managing stubborn, persistent and “difficult to treat” conditions. Low level lasers are sometimes referred to as cold lasers because they are not associated with a heating response of the body tissues. This is notably different when compared to high power surgical lasers often referred to as hot lasers. Cold laser therapy enables tissues to heal faster. More specifically, cold laser therapy harnesses the therapeutic energy from low level lasers that emit red and near infrared light to enhance cellular functions. 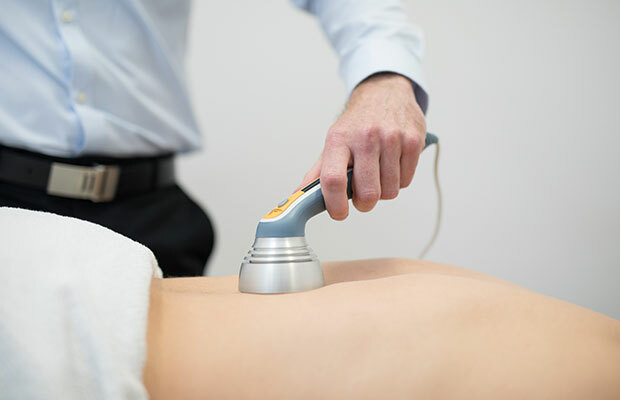 During the laser session, therapeutic wavelengths and densities of light are applied via a handheld laser device directly to the injured or painful area. The laser is programmed to emit specific wavelengths and outputs to deliver a concentrated dose of laser energy appropriate to the target tissue. When laser light penetrates the body tissue, light is absorbed by damaged cells triggering a series of physiological changes. These are found to modulate cellular metabolism, which reduces inflammation, accelerate the tissue healing processes and promote pain relief. Cold laser therapy has very few contraindications and is a popular therapy. When following established treatment protocols, therapeutic lasers allow for deep penetration of tissues without the unwelcome effects of thermal damage to the tissue. Our chiropractors have undergone extensive training in the indications, contraindications, dosing and administration of low level laser therapy to ensure best outcomes. What are the side effects of cold laser therapy? Low level laser therapy has been widely used from the 1970s as a therapeutic modality, specifically for pain management, with no significant adverse effects or long term side effects being reported. Is cold laser therapy suitable for everyone? Cold laser therapy is well tolerated and can be used to treat people of all ages. eyes (during your cold laser therapy session, you will be given a pair of tinted safety glasses). Precaution should be used when treating patients using photosensitising medications, with tattoos or dark pigmented skin. As a precautionary measure, reduced dosage may be recommended. Research studies suggest the benefits of low level laser therapy are accumulative: it may take several treatments for the results to become evident. The number of sessions needed depends upon the condition being treated, severity of the condition and each patient’s individual response. Does low level laser therapy hurt? Although you’ll feel the laser device touching your skin, the procedure is painless and non invasive. How is low level laser therapy used at Health First Chiropractic? Our chiropractors provide cold laser treatmentas an adjunctive therapy among a variety of treatment approaches, for patients seeking a safe, non invasive and painless approach to managing painful musculoskeletal conditions. It can be used alone or in combination with a number of other chiropractic treatment approaches. 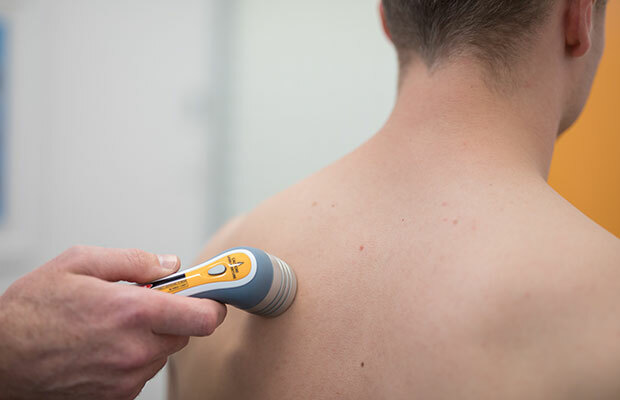 We recognise cold laser therapy has been shown to assist with a broad range of clinical conditions and our focus is heavily geared towards musculoskeletal pathologies. Our laser equipment has been specifically selected with parameters in mind for optimal management of conditions we commonly see in the chiropractic practice. We have a range of laser applicators available with variable wavelengths and power capabilities enabling us to treat both superficial soft tissue injuries and deeper joint conditions. Click here to book a low level laser therapy appointment.